Happy SPRING and Happy April! It’s been a minute since I’ve done a blog post. Even though we’ve been quiet around here, we are still here! Checking email 5 times a day, posting on social media here and there, and even listing new designs every once in a while. I wanted to share a few new ones and also tell you we’re having a DESIGN SALE through Monday (4/22/19). All of our designs are 40% off! QUICK STITCH is the the name of the game. 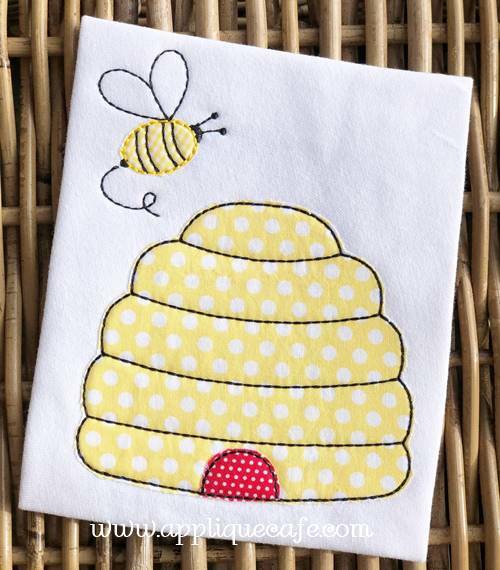 While the below BEEHIVE is applique (meaning with fabric), the satin stitch is replaced with a bean or redwork stitch which cuts your sewing time down quite a bit. I did use Heat N Bond Lite on my fabrics. 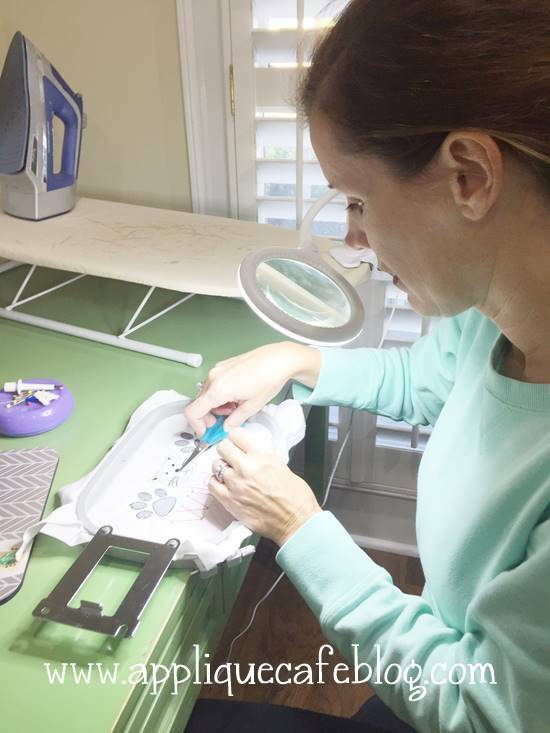 Ironing the design after I’m done will ensure the fabric fuses to the shirt and doesn’t come loose. This would be cute with a name underneath in RED to match the beehive “door”. 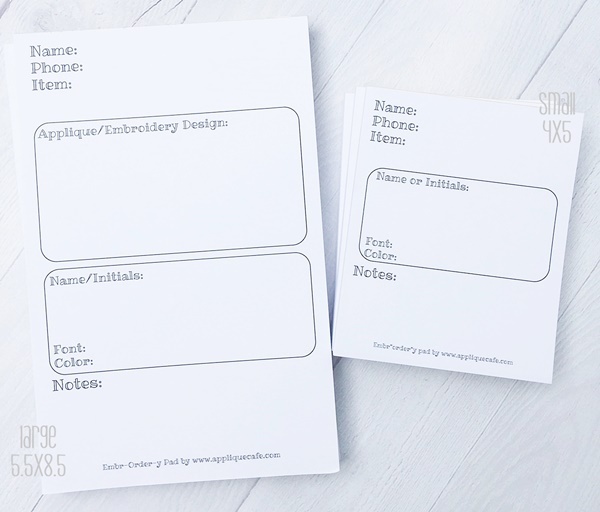 Along with our DESIGN SALE, I also marked down our Embroidery Order Notepads as well. I LOVE these for jotting down my embroidery orders and they are now on sale for a limited time, while supplies last! Each pad has 50 sheets! 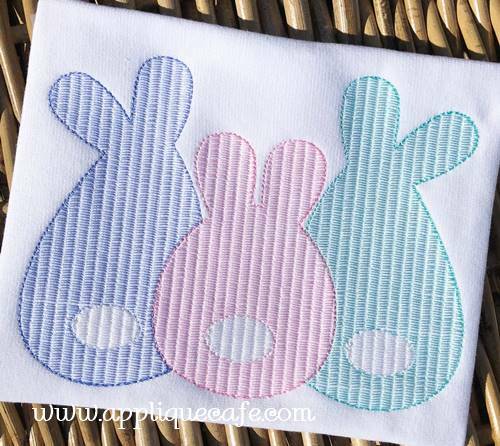 The smaller ones are perfect for simple monogram orders, while the bigger pads (see left) are great for applique or more complex embroidery orders where more information is needed. 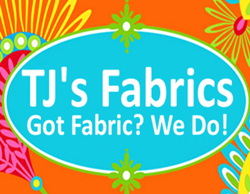 We’ve recently come out with several new EMBROIDERY designs (meaning thread only/no fabric). I call this a “light fill (light filled-in)” stitch. 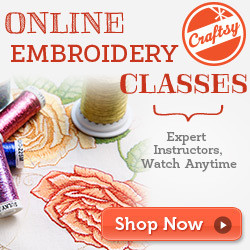 It’s not super dense like most embroidery designs and it sews very quickly! I did a baby gift set yesterday and my goal was “what is the fastest stitching design I can do?” When you are doing a set like a bib, burp cloth and onesie, fast is good! All thread is good! The stitching of these designs resembles seersucker! 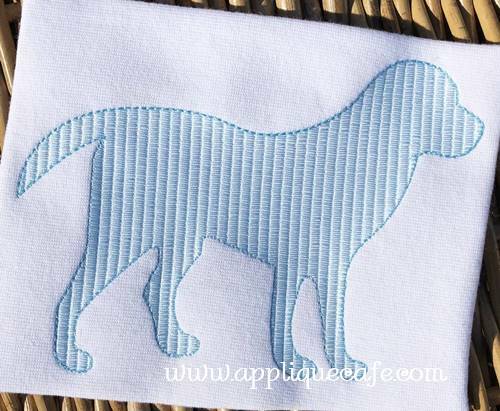 Of course our popular “Stitch” lab design! 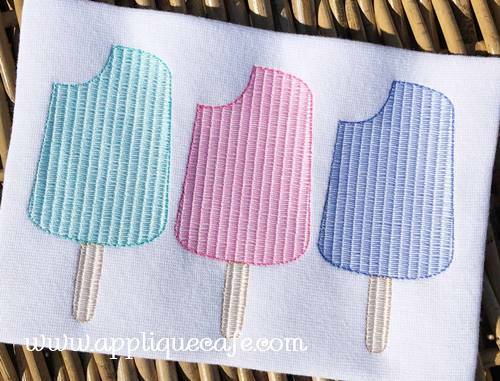 I L.O.V.E this Popsicle Trio design which is a must for summer! The color possibilities are endless and you can easily match any shorts! 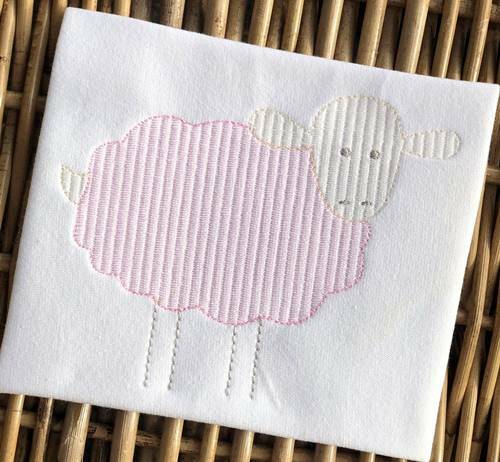 Lastly our Sheep design which is adorable for baby. 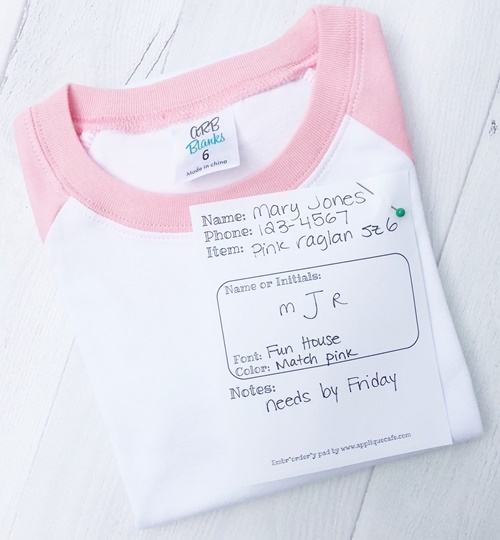 Would be cute also in baby blue, soft green or yellow. If you are reading this, thanks for stopping by! I get a lot of emails! Customer emails, your-website-needs-attention emails, restaurant emails…. 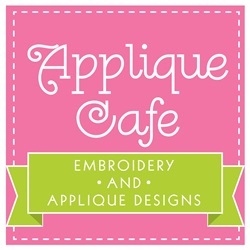 because Applique CAFE and all. Well a few weeks ago I got an email that caught my attention. It was from a company called Brightech asking me if I was interested in trying out one of their magnifier lamps. I turned 38 46 this year, and to be honest, I can’t see much of anything close up without readers. Like my food is blurry on my plate in front of me. I can see far away just fine, but anything close up is a struggle. The whole turning-40 and needing readers thing is legit. 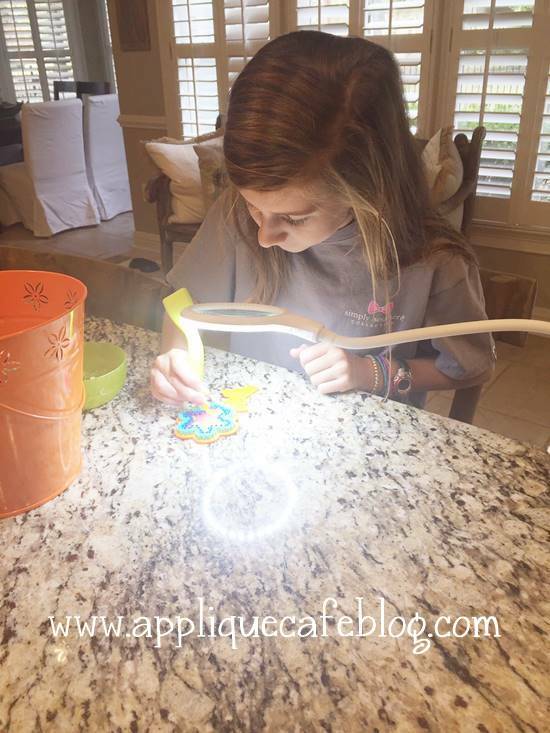 So YES, MAGNIFIER LAMP?? Sign me up!! I chose the LightView Flex Clamp Lamp because I liked the idea of it having a clamp to clamp on to my desk, and I liked that it seemed small and easy to maneuver around my sewing room. It has 175% magnification so I’ve found it wonderful to use in a variety of ways without straining my eyes. Plus I can use it with or without my readers. The neck of the lamp is flexible and you can maneuver it however you like. First up, clipping those tiny threads from an all-thread embroidery design I was testing for a project the other day! I used my lamp and could easily see a few of the tiny jump stitches and was able to trim them closely and easily because I could SEE!! 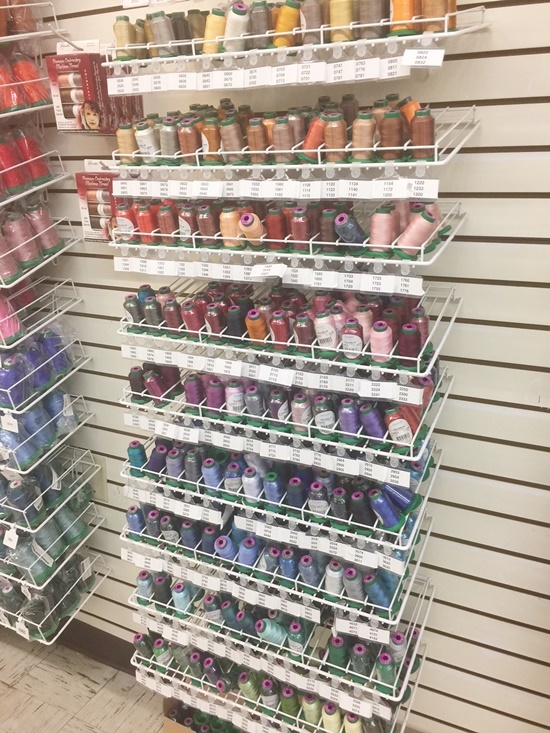 Who else strains to see the TEENY TINY numbers on your spools of thread? Even with readers on, I have a hard time telling a 3 from an 8. I’ve used it to see the water soluble stabilizer left in my letters after I’ve pulled the stabilizer away. Water soluble is pretty clear and sometimes hard to see. 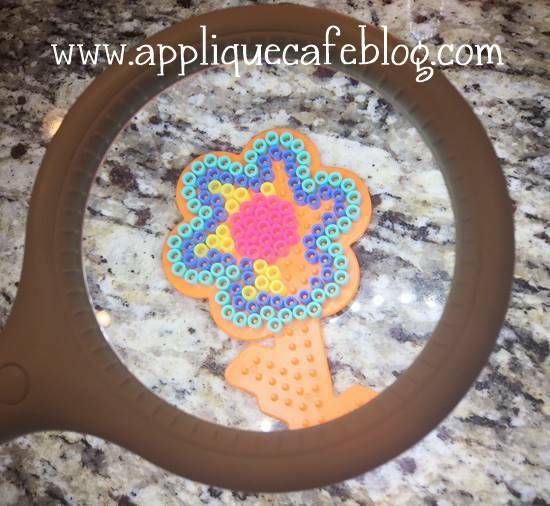 Magnifier Lamp….. I am able to see even the tiny spots in the loop-ty loops and get rid of them! 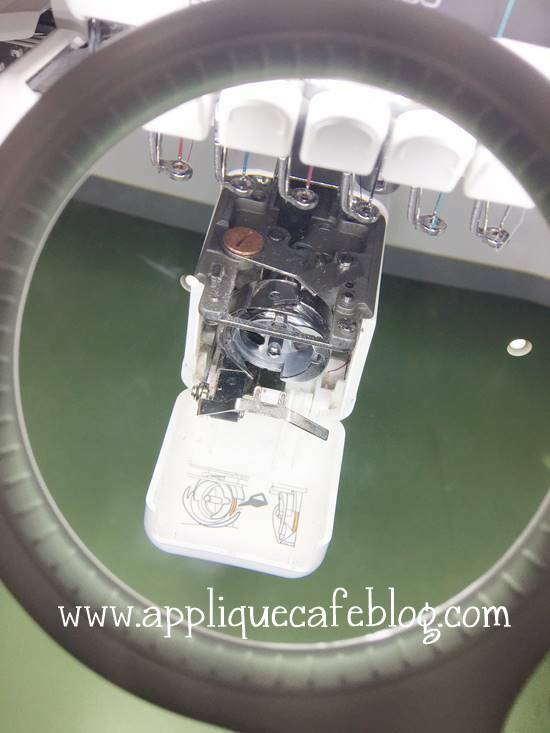 Cleaning my bobbin area…. you can literally see every stray piece of thread and a million specs of dust! I, of course, have used my lamp all over my sewing room the past couple of weeks doing embroidery and machine maintenance. 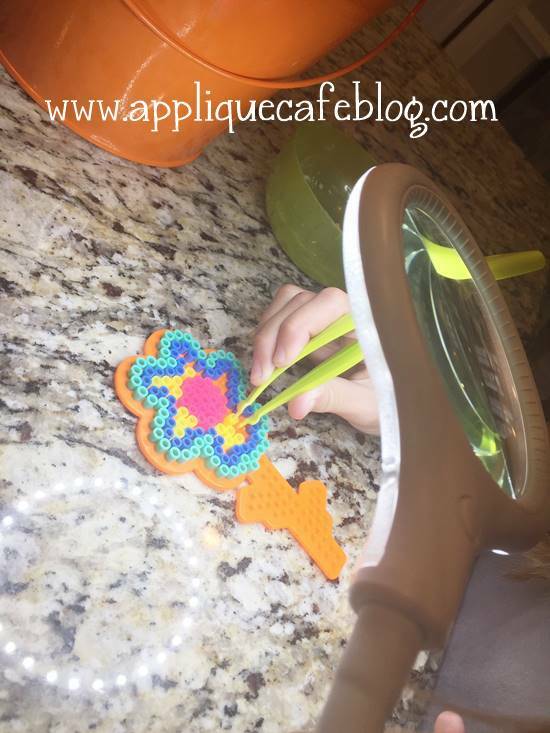 My daughter borrowed it also to do a little crafting with her perler beads. It clamped on to our kitchen counter easily and the lamp is small enough that it’s easy to move around the house. 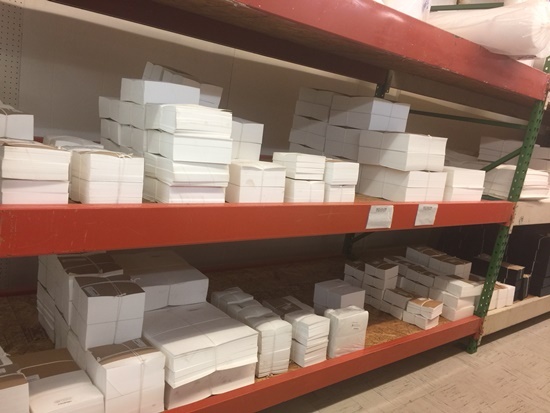 There are other magnifier lamps available and several come in white or black. There is a Table Flex that has an interchangeable base and clamp so you can use it as a table lamp OR attach the clamp wherever you’d like. 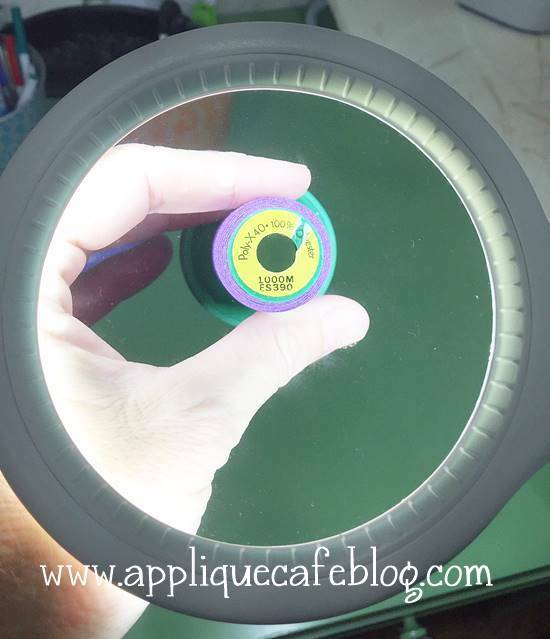 They also have bigger magnifier lamps with rolling bases and floor magnifier lamps. Brightech also sells the popular string lights you see on patios and at restaurants as well as regular decorative floor and cool table lamps if you are looking for something for your home. 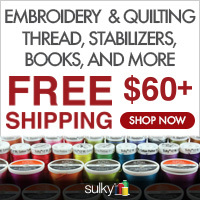 They offer free shipping with US orders over $50 and their prices are great too! Click on any of the links or HERE to check them out! I have to admit I have also used the lamp with my kids and have decided I would love to be an Aesthetician in my next life. We’ve had ear clean-out sessions (EWWW!!! – using a safe wax removal kit of course) and I’ve also used it to check out my 15 year old’s complexion. It’s AMAZING what all you can see with this lamp! Unfortunately I got to see his bad shaving job too. 15 year old mustaches are no joke. Please email me if you have any questions! Again, click on any of the links or HERE to check them out for yourself! I’ve only had mine for a couple of weeks so I’m just scratching the surface of what all I can use it for in and around my sewing room and around the house! In my last post I reported that my machine had died and I took her in last Monday to get repaired and serviced. Hooray she is alive! I rode back over to Sewingmachine.com this morning to pick her up. They are located in Atlanta, GA but also have a store in downtown West Point, GA which is about an hour and 10 minutes from my house. I’m listening to Girl, Wash Your Face by Rachel Hollis via Audible, so it made the drive go by fast. AWESOME book by the way! I still have about 10 chapters left. Anyway, they fixed the rotate error and also serviced her so she’s running like a champ! Back in the day, I taught a class at Sewingmachine.com but had not been over there in a couple of years. The ladies there are so nice and helpful and I always enjoy going, even if it’s to get my machine fixed! Here are a few photos from today! 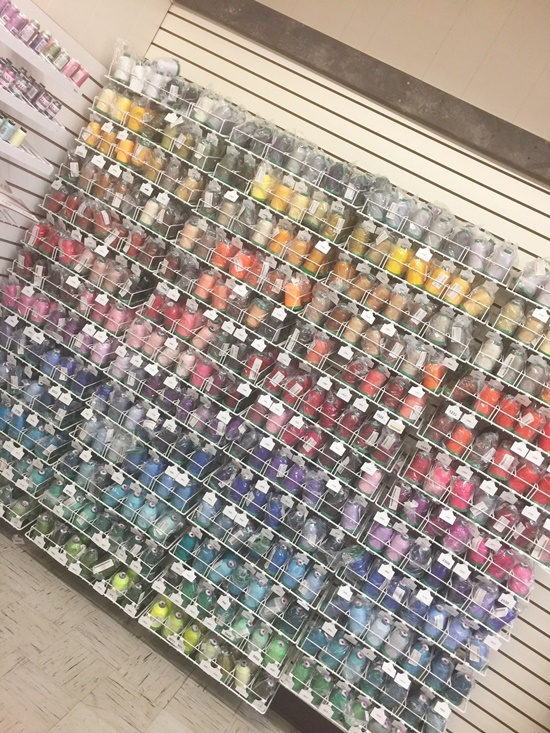 They sell more thread that you can ever imagine! 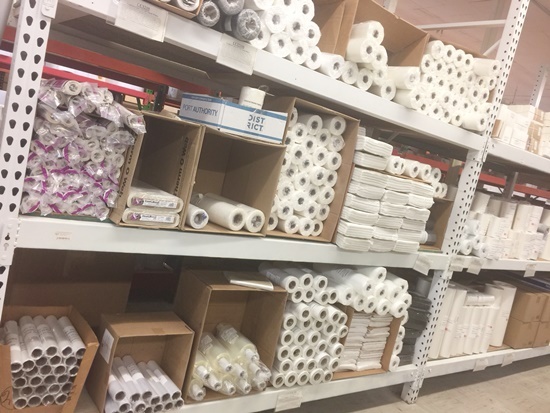 Lots of the big 5000M spools, but also some of the 1000M spools. I mainly use Isacord brand which they sell in both sizes. Here is the Floriani wall… again, more colors than you can ever imagine! Beautiful drool-worthy colors!! Here is the Isacord 5000M spool wall! Thread for DAYS!! 5000M spools last for a really long time too, so your black and white and colors you will use a lot of, it’s worth it to get the big spool. 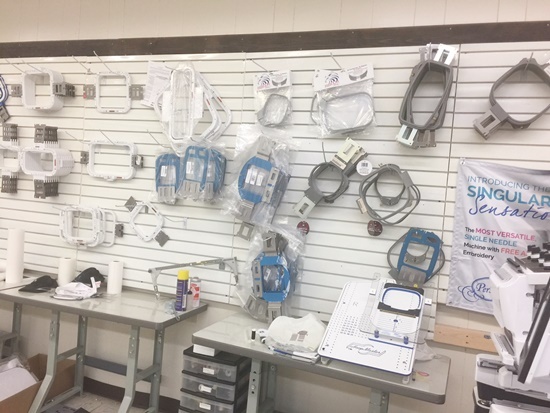 Commercial stabilizer = less expensive! 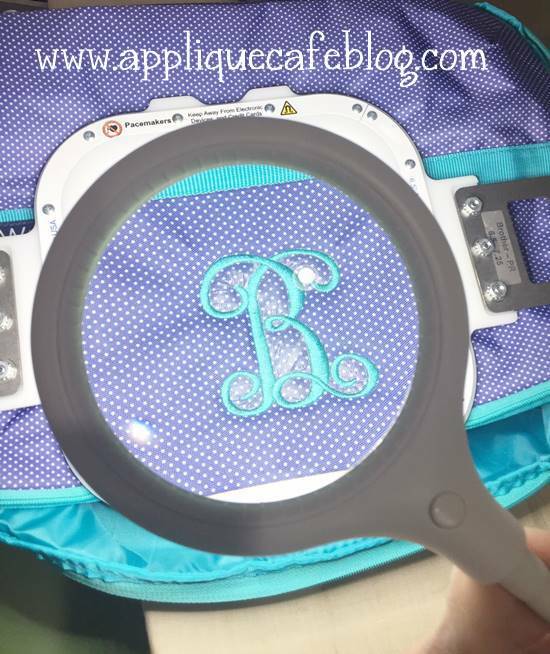 Cutaway, tearaway, water soluble, comfort cover (the stuff that you iron on the back of your monogram/embroidery/applique design), and HEAT N BOND LITE by the roll or bolt. They also sell some name brand stabilizers like Floriani, but I mostly use the commercial stuff! Any and every kind of stabilizer…. Pre-cut stabilizers are da bomb!! 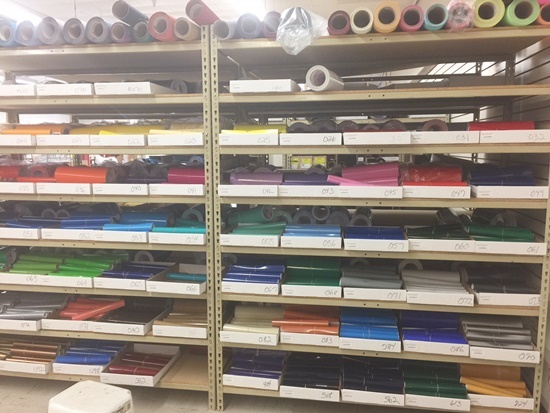 I know it only takes a second or two to cut off a roll, but grab a pre-cut sheet, hoop and go! I use their waffle weave tearaway AND medium cutaway pre-cut squares. Again, super affordable too! OK so I don’t do vinyl. I honestly barely understand how it works. BUT… they have racks and racks and racks of vinyl for sale! 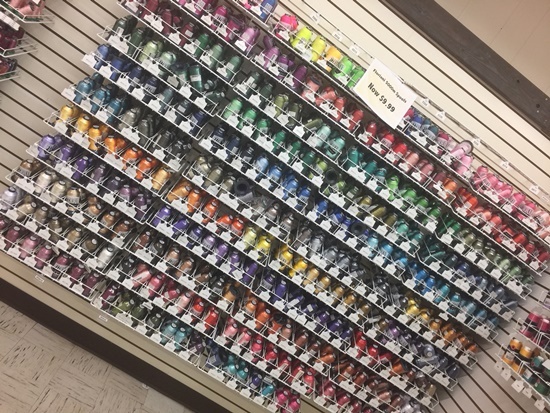 Look at all the colors! This is just a fraction of what they have! Stabilizers, thread and all the other stuff you need + HOOPS, hoop and more HOOPS. These are the Mighty (magnetic) Hoops and also the Durkee Hoops. They come in all shapes and sizes! I have the 9×9 and 6×6 Durkee hoops plus the Durkee Cap Hoop. I also have 2 of the Mighty Hoops which I LOVE! I have a Brother PR650 6-needle in case you are new! I’ve had it for about 7 years, but I keep it serviced and CLEAN so it still has a lot of life left in it! 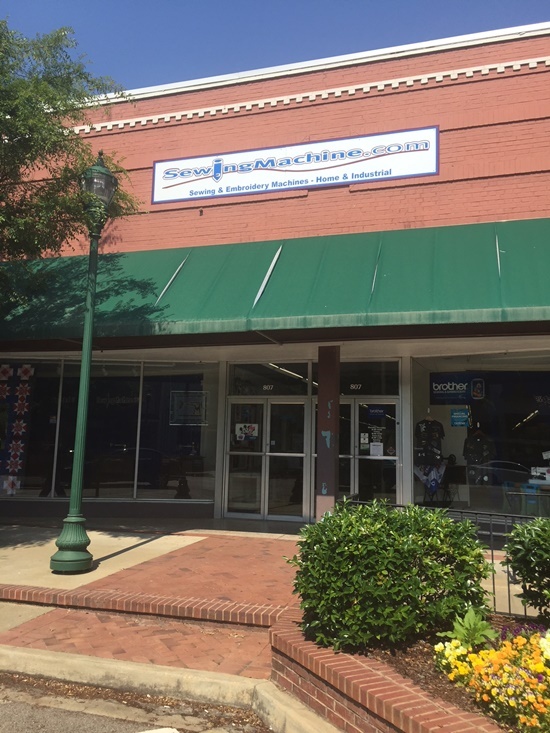 If you are in the Alabama/Georgia line or Atlanta area, check out Sewingmachine.com OR order online! 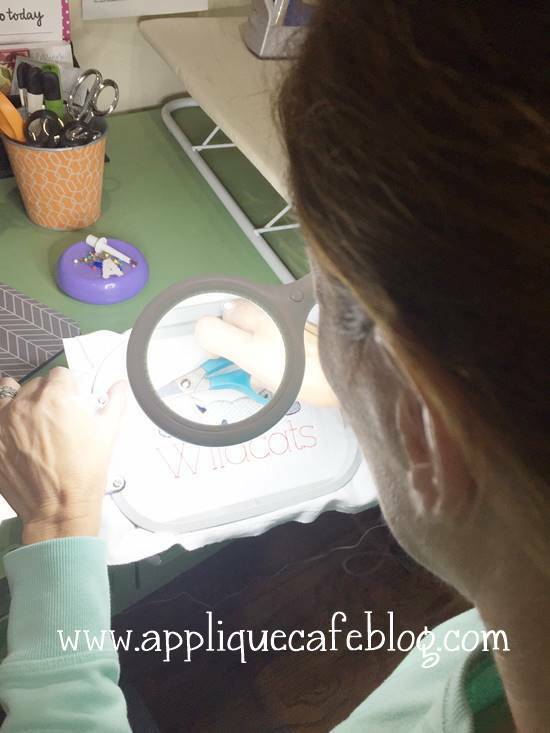 If you have any questions about what I use, just email me at rosemarygulledge@appliquecafe.com!